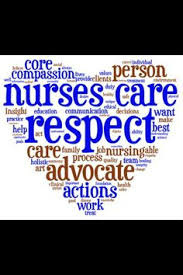 Respect Nurses...Is that too much to ask? I have been doing a lot of thinking about my profession since the episode of The View earlier this week. Upon initially watching the segment where the ladies referred to scrubs as a costume, accused a nurse of simply reading her email, and calling a stethoscope a doctor’s, I have to admit that I wasn’t initially too bothered by it all. I found their comments to be rude and catty but overall I just chalked it up to them being people of below average intelligence and went on with my day. However, along with a high percentage of Americans I continued to be inundated with opinions regarding the whole incident on all facets of social media. Using my super-enhanced listening skills, I began to actually hear what my peers were saying. I believe that the reactions of nurses nation wide is simply a symptom of the disease that is our profession. I find it interesting that nursing continually lands a slot in the top three (and generally first) of respected professions in polls across our country. As an ER nurse of almost 20 years, I do not feel respected and I have a small inkling that I am not the only one who feels this way. I didn't become a nurse to get rich. I didn’t become a nurse to be respected. I became a nurse because God himself knocked on the door to my heart and told me that it was my responsibility to make the world a better place and to use my love and my intelligence to help the ill and injured. It is not an easy job. It is physically exhausting and on any given shift I never walk less than four miles. I lift obese patients. I bend over to start IVs. My hands look like a construction worker’s hands because not only do I wash them 60 times a day but I am also foaming in and out of every room even when I just stick my head in to explain that I will be back in a few minutes to talk to them about their plan of care. Nursing is also mentally and emotionally exhausting. Choking back tears when someone’s grandparent dies or watching a parent fall to the floor when they hear that their child will not live to see tomorrow can drain your energy for days. Double checking calculations and physician orders and plans of treatment knowing that someone’s life literally depends on it is also a taxing ordeal. I may not have become a nurse to be respected but by no means do I think that this is too much to ask. Please don’t insult me by telling me that it is time for me to move on if this is how I really feel. Frankly, you are wrong and it is none of your business. I could write a novel comparable to the size of War and Peace filled with joyful reasons and emotions about my profession. However, that isn’t what this week is about. This week is about how nurses everywhere are feeling. I believe we are feeling disrespected. People can say that they respect us however on any given day many patients and visitors roll their eyes at us, curse at us and question our every move. Just yesterday, I was shoved by a person because they were upset regarding the long wait time. I have been punched in the face. I have been involved in a hostage situation… And it isn’t limited to patients. Not too long ago, I was explaining hospital policy to a resident who completely disregarded my words and then proceeded with what they were doing despite my knowledge of policy and procedure. I also recently had a discussion with a physician who stated that “nurses don’t know how to properly take an oral temperature.” ARE YOU FREAKING KIDDING ME? I truly wanted to explain that I know how to take temperatures of every route and was willing to demonstrate this on him starting with a rectal. He was so convinced that the entire staff coincidentally received an email reminding us of the proper technique. It didn’t come from him but I knew where the topic originated. Situations like this prove that we are not truly part of a team but instead the "water boys" for their team. Poor Joy and that other lady that I have never even heard of…the one that thinks Alzheimer’s is funny….nope...Michelle something?…still can’t think of her name and won’t waste my time googling someone that I will forget in another week or so. Anyway, my point is that much like the nagging back pain that turns out to be a metastasized carcinoma, our outrage of this woman’s comments are the tell-tale symptom of a much larger problem.